Disclaimer: Please note the J2Store plugin is a third-party extension that is unsupported by the SEBLOD project or Octopoos. J2Store has just released a new plugin for their component which brings their cart functionality to SEBLOD-created content. 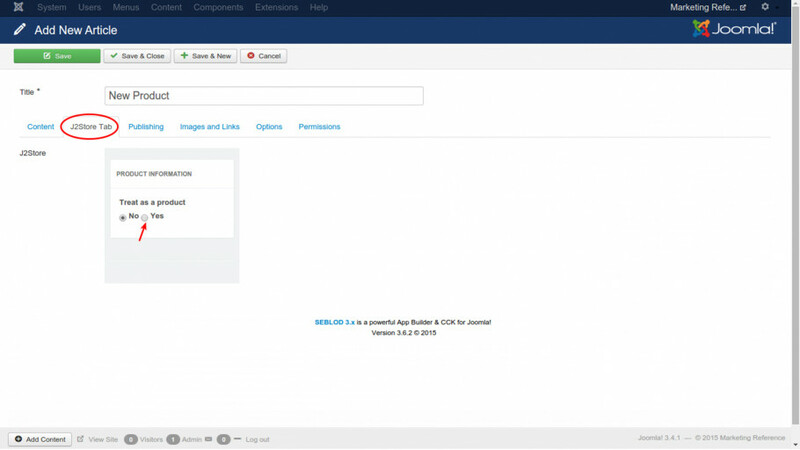 J2Store is an eCommerce component for Joomla. The component itself provides carts, shipping calculators, checkout, tax management, and a suite of other tools for you to turn your Joomla website in to an online store. It manages products by allowing you to turn a standard Joomla article in to a “product” that can be added to a cart and purchased through your site. Since SEBLOD sits as a layer on top of Joomla, the J2Store developers have created a plugin that works with SEBLOD so that your custom SEBLOD content types can also become “products” that work with the J2Store eCommerce cart and checkout system. Integration with the plugin is done through a SEBLOD field called “J2Store”. Adding this field to your Site Form or Admin Form will bring J2Store tools in to your content management workflow. You can read the full, detailed J2Store SEBLOD Field Documentation here. Once you add this to your Site or Admin Form, hit “Yes” to treat this item as a product and press “save”, you will see all of the J2Store options that you can use to configure how the product should behave in your store. Finally, adding the J2Store field to your Item View or Content View will show the “add to cart” options for the product in the front end. Overall, the plugin works as advertised, and gives you a quick and easy way to turn your SEBLOD content in to sellable products on your website. However, I personally think that the effectiveness of the approach to use 2 components to manage content and shop-related options within that content is limited. In my opinion, it would be great to have the flexibility to use SEBLOD fields (or a full SEBLOD app) that could be used to define the options within J2store, rather than having J2store as a separate layer sitting on top of the content. Then, J2Store could sit as the component that powers the eCommerce functionality, but all of the options (product images within the cart, taxes, pricing) would be managed by SEBLOD fields. All things considered though, as far as I know this is the easiest way to bring eCommerce in an “integrated” way to a SEBLOD site. Well worth a look if you’re building an eCommerce site. Best of all, it's free! Well done to the J2Store Team. A real seblod commerce solution !